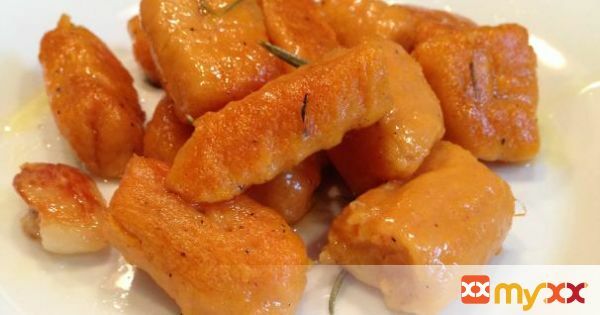 I decided to make Sweet Potato Gnocchi with a simple Rosemary Garlic Butter. Gnocchi are not difficult to make but are a little bit time consuming. There really isn’t much to the pasta dough here, its simply sweet potato, an egg, flour, cinnamon, salt and pepper. These gnocchi are beautiful little tender pillows of deliciousness! I love the combination of the sweetness of the potato with the rosemary and garlic infused butter. The butter is slowly cooked along with a couple sprigs of rosemary, crushed garlic cloves, salt and pepper. After the gnocchi are cooked in a pot of boiling water they are drained, tossed in with the butter and quickly sautéed until they develop a gorgeous light golden crust. I love biting into the gnocchi and first getting that golden crisp and then into the light and tender pasta. This dish is absolutely worth the effort and I can’t wait to try out even more varieties! 1. Cook the potatoes in the microwave and once cool enough to handle removed the skins. Mash the potatoes very well or if you have, press the potatoes through a ricer to avoid having any lumps in there. 2. Add in the egg, flour, cinnamon, salt and pepper and mix until well combined. Form into a ball, dust lightly with flour and place into a bowl to rest for 10-15 minutes. 4. Cut the logs into 1 inch pieces, toss with flour just to coat each gnocchi. Roll each gnocchi on the back of a fork to get those lovely indentations. Refrigerate the gnocchi while you now make the sauce. 5. Heat a large sauté pan over low heat. Add in the butter, rosemary, garlic, salt and pepper. Once the butter is melted allow if to cook for about 15-20 minutes, gently swirling the pan to prevent burning. The butter will have a beautiful light golden color. 6. Carefully drop the gnocchi into a pot of boiling water. Cook for 5 minutes then drain. 7. Toss the gnocchi with the butter, crank the heat up to medium high and cook for a few minutes just until a light golden crust has formed on one of the sides of the gnocchi.